The Houston Chronicle and the San Antonio Express-News reported that nearly 400 Southern Baptist church leaders and volunteers have faced sexual misconduct allegations in the past two decades. As many as 700 victims - some as young as 3 - were sexually abused, some raped and molested repeatedly, according to the report. The revelations, published Sunday, have not only led to a chorus of condemnation and calls for restructuring but have also pushed church leaders to grapple with the troubling history - and future - of the largest Protestant denomination in the country. The Southern Baptist Convention, a fellowship of more than 47,000 Baptist churches and 15 million members across the United States and its territories, is the country's second-largest faith group after the Catholic Church. Greear, who was not available for comment Sunday afternoon, addressed the investigation in forceful terms, saying in a lengthy Twitter thread that he was "broken" over what it had revealed and that it was a "heinous error" to apply Baptist doctrine in a manner that enabled abuse. "The abuses described in this (Houston Chronicle) article are pure evil," Greear wrote. "I join with countless others who are currently 'weeping with those who weep.' "
Greear called for "pervasive change" within the denomination, including taking steps to prevent abuse, fully cooperating with legal authorities when people reported abusive behavior and helping survivors recover. He did not go into detail about what those steps would be, except to say that "change begins with feeling the full weight of the problem." Greear also admitted that the church had failed to listen to abuse victims, although it is unclear whether he was indicating that he had known about allegations within the Southern Baptist Convention. He added: "We - leaders in the SBC - should have listened to the warnings of those who tried to call attention to this. I am committed to doing everything possible to ensure we never make these mistakes again." Russell Moore, president of the Ethics & Religious Liberty Commission of the Southern Baptist Convention, said the revelations are "alarming and scandalous" and paint a stark portrait of the depravity of those who used their positions of power to prey on the defenseless, all under the guise of faith. He called on churches to immediately report possible instances of sexual abuse of children and adults. "In all of this, the church should deal openly with what has happened in the church while caring for all those who were harmed," he wrote. "No one who has committed such offenses should ever be in the ministry arena where such could even conceivably happen again." In Texas, where the newspapers said many of the abuses happened and where the Southern Baptist Convention has some of its most prominent congregations and pastors, church leaders expressed similar feelings of alarm. "May there be peace upon the victims & may we do our part to make necessary changes as a convention," Michael Criner, a senior pastor at First Baptist Church in Bellville, Texas, wrote on Twitter. Criner said he has attended and ministered at Southern Baptist Convention churches his entire life. Megan Lively, who accused a prominent Southern Baptist leader of encouraging her to not report to authorities that she had been raped, said that although she knew there were others with similar stories, she was shocked by the number of victims revealed by the newspapers' investigation. "I can't put into words the utter despair I felt earlier and continue to feel now," Lively said in an email to The Washington Post. Lively told The Post last year that she was raped in 2003 when she was pursuing a master of divinity degree in women's studies at the Southeastern Baptist Theological Seminary in Wake Forest, North Carolina. The seminary's president at that time, Paige Patterson, urged Lively to not report the alleged abuse to police and to forgive her assailant, she said. 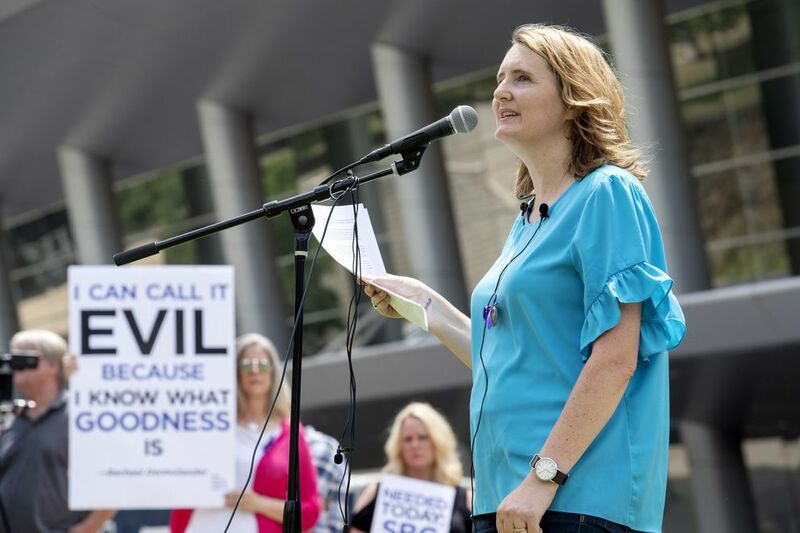 Lively said there won't be an "overnight fix" for the problems of sexual abuse, but she's confident in the current Southern Baptist Convention leadership. "They fought for me and loved me, many times behind the scenes with no public recognition in an effort to keep me safe and keep my story private. . . . They are working hard to make sure past mistakes are not repeated," Lively said. "SBC leaders must be willing to listen to the hard stories, difficult requests, and advise survivors . . . in order to change the culture," she added. Victims, she said, should seek professional help and find someone with similar experiences. For Lively, that person was Rachael Denhollander, the first woman to publicly accuse former Michigan State University and USA Gymnastics doctor Larry Nassar of sexual assault. "In the worst times I shared my heart with her and she made me feel like I was completely normal to react the way I did," Lively said. "Survivors need fellow survivors to walk with them. During the good and the bad." Denhollander also tweeted about the report Sunday. "The worst part is that we have known for years. I have known most of this for years, and spoken out about it. No one wanted to listen. It did not matter enough to investigate and act," Denhollander said. "Grief and repentance and silence to learn is the only proper response." Denhollander's husband, Jacob, said the number of instances of sexual abuse is not the primary problem. "Better training and protection policies can help address that," Jacob Denhollander tweeted. "The bigger issue is that there is a pattern of leaders, who knew of the abuse, protecting the perpetrator and shaming the victims." The Washington Post’s Max Rosenthal, Michelle Boorstein and Sarah Pulliam Bailey contributed to this article.